Heading out to the golf course is a popular American pastime. In 2016, over 23 million golfers took to the links. While the basics of golfing haven’t changed over the years, the technology available to players has. Using golf technology to improve your game can lower your score and maybe even give you bragging rights in the clubhouse. Whether it’s using the latest clubs to improve your swing or using GPS technology to track the distance to the green, there are many ways for technology to improve your game. One key piece of technology that you likely have access to is the smartphone. Your smartphone can do more than take pictures or allow you to text your friends about that birdie putt. It also offers access to an array of golfing apps you can use to help you progress and become a better golfer. We’re here to tell you about the 7 best golf apps that can help improve your golf game. There is no shortage of golf-related apps you could choose. We’ve selected to 7 we feel are the best for improving your golf game. This app is a great addition if you’re trying to improve your swing. The app provides access to a collection of over 2,000 videos from top golfing instructors. No matter what aspect of your swing you’re trying to improve, there’s no shortage of videos from pro golfers explaining how to make your swing better and improve your game. If watching videos isn’t enough to improve your swing, you can use the app to find a Golf Channel Academy coach nearby who can work with you in person. All these features make the Golf Chanel Academy a great app. Another great app, Golfshot can help you with keeping track of your score. But it doesn’t just keep track of your score, you can use the app to track the scores of friends as well as you play golf. The app also allows creates graphs of your performance in driving, your short game, and putting. This means you’ll have insights into your golf game you can use to improve your performance. If that wasn’t enough, it will provide you with distances for over 38.000 golf courses, so you don’t have to guess how far away the green is. If you go for the Golfshot Plus version of the app, you’ll be able to find real-time distances to the green and hazards. You’ll also get a 3D flyover preview of each hole and personalized club recommendations based on your previous shots. This app has an expansive list of golf courses around the world. Using this app, you’ll have no trouble finding the nearest golf course when you want to play golf. The app is great if you’re a frequent traveler but still want to be able to find a golf course that meets your needs wherever you are. You’ll always be able to practice even when you’re in an unfamiliar area. It will also give you directions to the course, contact information so you can set up your tee time, and even give you an overview of the course. This makes Golf Nearby a handy travel accessory for those of you who are determined to get in a round while on the road. 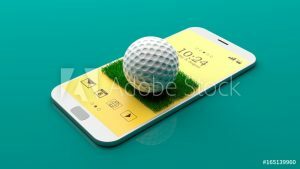 Maybe you’re the type who doesn’t want to load your phone with all sorts of different golfing apps. If so, then this is the only app you’ll need. This app serves as a GPS rangefinder, handicap calculator, and can track live scoring. Also, the app helps you book tee times and track your performance, so you can see how your game is progressing and where you need to improve. It’s hard to beat this one as your go-to app of choice. A great tool for improving your golf swing, this app allows you to use your phone’s camera to record and analyze your swing. The app lets you analyze your swing in slow motion as well as frame by frame. You can edit the video and even add notes to it. One great feature of this app is the ability to compare your swing to the swings of over 50 professional golfers from the PGA, LPGA, and Champion Players tour. This allows you to see how your swing stacks up against top golfers and find ways to make your swing better. While this is predominantly a scorecard app, it offers other features that will help you improve your game. Naturally, it helps you keep track of your score, strokes, sand shots, chips, saves, penalties, putts and other scoring metrics. But it also has some GPS features to help determine the distance to the green or hazards along the course. It will also keep track of your game histories and stats, so you can use this information to find new insights into your game. Another app you can use to analyze your swing, the Swingbot features video playback and allows you to upload the video from your smartphone. What sets this app apart from other swing improvement apps is its ability to give instant feedback about your swing as you play golf. This means you can use it while you’re out on the course as well as when you’re practicing your swing. Ever wonder what went wrong with that last shot? Look at the app and you’ll be able to see your last swing. By uploading the videos to a library, you’ll also be able to track how your swing is changing over time. Before heading out to play golf, you should download some of the great golfing apps here. These apps can help you improve your game and make your day on the links more enjoyable. We’re always happy to get feedback on any great golf apps you’ve found. Let us know if you have any favorites we didn’t mention.